AllWest routinely performs seismic assessments conforming to Level 2 Investigation as defined by ASTM 2026-16a, ASTM E 2557-16a and ASCE 41-13. We use the ST-RISK computer software. Our goal is to provide a seismic risk assessment with a low degree of uncertainty. 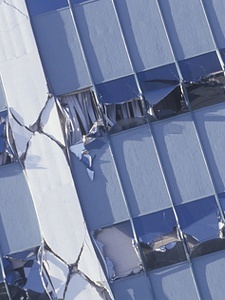 In special cases, such as high rise buildings in downtown San Francisco or elsewhere designed and constructed in the 1950s or 1960s or displaying structural irregularities, a Level 2 Investigation is supplemented with more refined methods of analysis, such as pushover computer analysis. The Level of Investigation is related to the seismic assessment level of uncertainty. If a building utilizes one or more lateral force resisting systems in its structural configuration AllWest performs separate risk analyses for each system and estimates a loss value for the building based on the contribution to the loss of each analyzed system using engineering judgment. For properties including more than one building AllWest averages the loss values using appropriate methods as well as engineering judgment. AllWest's seismic assessment culminates in the estimation of Scenario Upper Loss (SUL) value. The SUL value is determined for a 475-year ground motion and has a 10% probability of being exceeded or 90% confidence of damage estimate. The PML90 value indicates the maximum damage expected to occur at 9 or 10 buildings that share locational and similar construction characteristics with the subject property. The ASCE 41-13 analysis is based on a 20% probability of exceedance in 50 years.